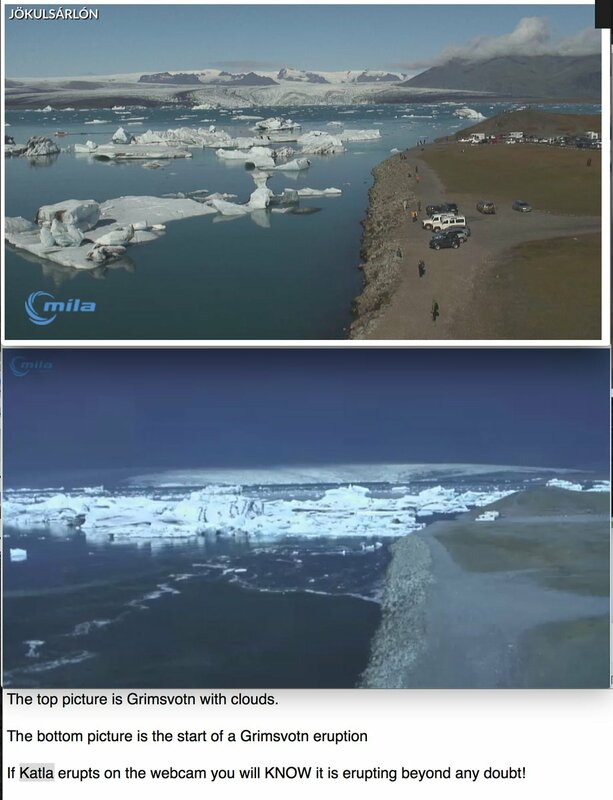 It was confirmed at around 22:00 UTC that a small glacier flood has now started from Mýrdalsjökull glacier (Katla volcano). At the moment the glacier flood is small. It is unclear if this glacier flood is going to remain small and run it course as it is or if it is going to increase in next few hours. Reports have been coming of strong sulphur smell in the area of Múlakvísl on Mýrdalssand area (desert area south of Mýrdalsjökull glacier). Civil protection authority in Iceland have closed down few tourist roads and limited access to certain areas for time being due to this glacier flood. I strongly recommend that people follow those closers since change can happen in Katla volcano without warning and the closer people are to the volcano the less time they have to get away from it if an eruption starts. This article is going to be updated as needed. What is the μS/m Conductivity in previous floods before a eruption? That is not known (no sensors in 1918). Last year the value did go above 600μS/cm. I don’t remember what the value was in 2011, that year the sensor was lost in the massive flood that year (along with the bridge and the road). Mulakvisl is rising pretty rapidly according to Léreftshöfuð; V414 station. Haha i realised that, I was talking about eruptions in general. Is there a database for example from Eyjafjalljökull eruption? Conductivity is not measured on Markarfljóts bridge and I don’t think it was also not measured in 2010. If there’s any correlation between seismic momentum and jökulhlaups in Myrdalsjökull, then this might be a big one. How big might the emptying cauldron be? No. What cauldron is emptying (or cauldrons, there might be more than one emptying) is not known at the moment. meant to say: big one compared to 2011. Jon, any way to make an editing function for commenters? These extra correcting-comments make me feel like a spammer. must be annoying for y’all. Perhaps those two bumps in the drumplots were two cauldrons emptying. 40 minutes apart or so. The glacier flood might come in two surges if so, the first one happening now? Sadly, WordPress doesn’t have that option. I don’t know why that is. As an admin I can edit comments and I don’t think regular users can edit there own comments. I found some plugins that offer that feature but I fear it might break things and not all be what it says it is. In 2011 there was a minor eruption under the glacier that started the glacier flood in July that year. That was a whole new level of dangerous flooding. As for the bumps you saw in the drumplots that might well be. 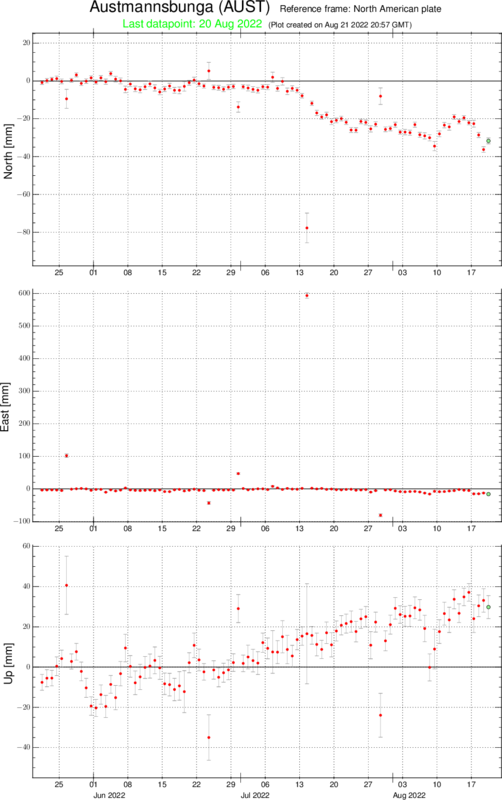 I don’t know how glacier flood appears on a tremor plot unless it is really strong signal. It takes time for the water to get under the glacier what we are now seeing might just be the start of a lot larger flood. All that can be done is to wait for what happens next. Z, it’s not annoying for me. I see those correct comments as an addition to the initial made comment. Better so, than having incomplete comments you don’t or partially understand. Please do not edit. We are following all theories. You should not have a problem with it. Since it is now a simple one. 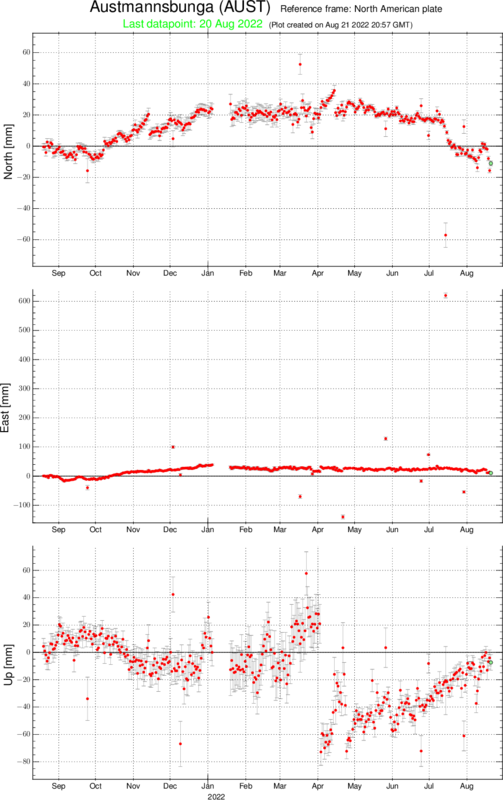 Harmonic tremor is fast increasing on SIL stations around Katla volcano. The only ones I know for sure to look at are Aus and Sly. Any others of note? The harmonic tremor is so strong that it appears on my geophone at Heklubyggð. Yes, this is magma. This tremor is a lot stronger then any glacier flood is able to make. I suspect that at the moment the magma is travelling up from deep inside the magma system. It creates this noise while it is doing so. If this doesn’t stop it is now just question of hours until a eruption starts. Wow. It’s 5 am here, wasn’t prepared for this. Coffee..? I accept, thank you! 00:06 Brasil. cheers. tremor seems to the fading away, though. In July-2011 the same thing happened. You can see on this article from back then how it looked during that minor eruption. Here is a article few days later that shows it clearly. Where do you live, Z? Watching this with much interest from the UK! Please keep the updates coming, they are much appreciated! The colour code for Katla volcano has been changed to Yellow. Harmonic tremor is now dropping from earlier heights. It seems that an eruption is avoided for now. This event that is happening now is small. It seems to have been smaller then in July-2011 and lasted for a lot shorter time. It is not known at the moment if the harmonic tremor is connected to Katla volcano minor eruption or the glacier flood that is on the way. Next few hours are going to increase the understanding of that detail. When the full eruption eventually happens, history suggests it will most likely be a VEI-4 with a relatively small chance of VEI-5 if there’s a lot of magma accumulated. Now I need to sleep for a few hours. I hope that Katla volcano is quiet while I do that (it might not do that). Next update from me is when I awake up after sleeping. “The color code of Katla volcano has been changed to yellow due to a glacial flood in Múlakvísl river and seismic tremor in nearby seismic stations. The tremor could be solely due to the glacial flood and unrelated to volcanic activity, but a subglacial eruption can not be excluded at this time. An earthquake of magnitude 3.0 was detected in the caldera of Katla volcano today at 00:48. Again, in the light of recent events, I made a graphic of Katla, showing all EQs this year so far. Stars are M3+ EQs. And there are a lot of stars. Katla sure is working hard this year. And a complete profile for 2017 from south and east. What is nicely seen right away is deep to mid stacked activity up to around 10km. This could be the extension of the feeder root up under the eastern caldera rim. this is just 2017 data. Combined with previous intrusions which I have tracked, there is already a good possibility that the feeder root is already connected up to 10km at least, not considering the likely previous intrusions before 1997 when my records begin. Also worth of note is a possible magma body/sill complex at around 8-16km depth. All in all its a complex system, tho Katla does take the main prize for having the best looking seismic profile in Iceland. If the graph is correct (Múlakvísl leiðni) the conductivity is now up to 580, a considerable rise on earlier readings. I do not think Katla (or at least the glacier which covers her) is at rest whilst Jón is sleeping. Just wanted to say hello from the UK. As an Iceland lover I’ve been following Katla closely and have found your site really informative. I travelled in Oct 16 when roads to Solheimajokull were closed. Further trips she’s been quiet but I’m coming in August and so am watching very closely! Looking at the GPS time series, I find a ‘strange’ event which seems to have been recorded yesterday. Can someone help me with this? Is it deformation/swelling due to magma flow? Where can I get the conductivity readings? Two silver landrovers on webcam ? 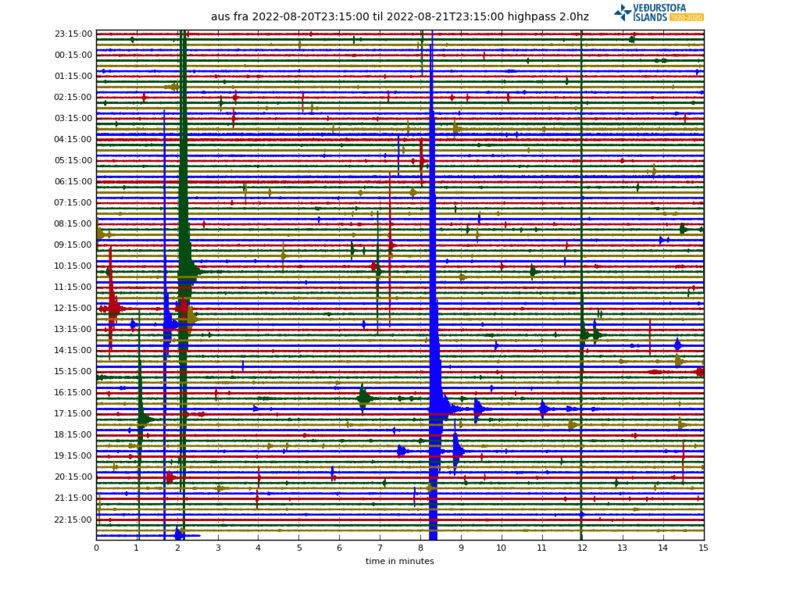 Based on this harmonic tremor activity there is more problem ahead. Jon what are you thinking at the moment could be the next problem ahead? Just in case I will repeat my public service announcement from a year or two ago. If you’re looking at the Katla webcam and see something and wonder ‘is that an eruption’? it is NOT an eruption. If Katla goes into full eruption there will be absolutely no question about what you’re seeing on the webcam; you’ll KNOW it’s an eruption! At this moment conductivity is dropping though it’s still well over 300, there hasn’t been earthquakes for a while…and the tremor graph Jón pointed looks more worrying than ever. I don’t think we’ll have to wait very long to find out the exact nature of the next problem. Like Mike said, it is totally pointless to try and look at the webcam for visible events. They obviously would reveal themselves in the different data plotters long before anything happens above the surface. Saara, I’m a bit alarmed by looking at the tremor plots, too. But yet the drumplot looks like it’s more or less flat-lining. How come? Also, these sudden skips towards south-west in the AUST GPS stations, are they anything to take into consideration? Or is the data yet to be corrected? And thanks to Jón for your patience, continuous updates and helpful/informative comments. Z, if I have understood correctly, harmonic tremor is typically caused by magma moving up in an volcanic system. Usually the same process involves earthquake activity, but they are neverthless different things so that magma could go up without the movement manifesting itself in simultaneously occuring earthquakes.